Treatment of tertiary alcohols with HBr leads to the formation of tertiary alkyl bromides. When treated with HBr tertiary alcohols typically undergo a nucleophilic substitution reaction to generate an alkyl bromide and water. The reactivity of alcohols is totally opposite in SN1 from SN2 reactions. The most reactive is tertiary alcohol, and the least reactive is methanol. 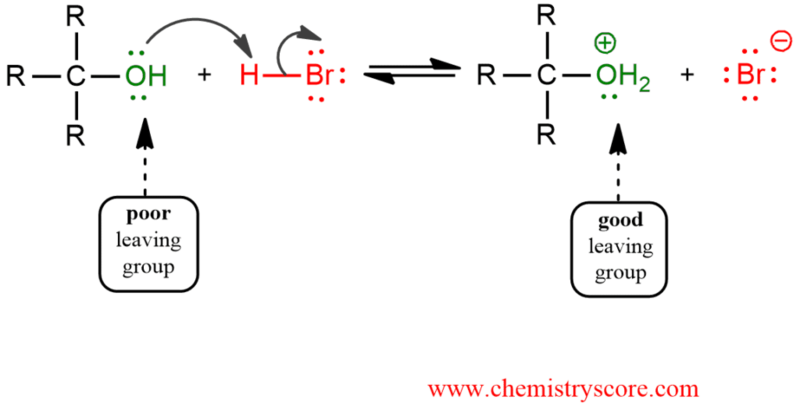 This reaction proceeds via a carbocation intermediate which can also undergo rearrangement. STEP 1. Protonation of the alcoholic oxygen to make a better leaving group. This step is very fast and reversible. STEP 2. Loss of the good leaving group by the cleavage of the C-O bond. The carbocation is formed. This is the rate-determining step. STEP 3. Attack of the nucleophilic bromide ion on the electrophilic carbocation creates the alkyl bromide.